Ileen McFarland, CurePSP Board Member and Dallas support group facilitator, talks to us about her upcoming event, Hope Squared, and about the motivation behind being one of CurePSP’s most active advocates. What is your history with PSP and caregiving? My late husband was diagnosed with Parkinson’s in September of 2006, and PSP in 2007. After his diagnosis, I searched the internet and discovered what was then called the Cure PSP Foundation. The foundation had a family conference scheduled that December in Baltimore, which I attended with my husband. That was my first exposure to what the disease was and what it held for us in the future. I cared for my husband through his last years until his death in 2012. When did you first encounter a support group? In 2007, I learned that there was a support group in Maryland, which was not active at that time. I contacted the volunteer, she and I met, and shortly thereafter we revived the support group with four people; two patients, myself, and the other caregiver. Within a few months, we grew to a group of about 15 people. It was a blessing for all of us to be able to meet once a month and share our experiences as patients and caregivers. When did you start running support groups? In 2010, our group’s facilitator was leaving the area and asked if I would take over. Another caregiver and myself decided to share the responsibilities and we continued as support group co-facilitators until 2015, when I remarried and moved to Dallas. My husband, who also lost his wife to PSP, attended the Dallas support group and we began facilitating the group in 2016. What is your history with advocating for PSP? After several years of caregiving, I became a member of the Patient and Caregiver Advocacy Committee for CurePSP. 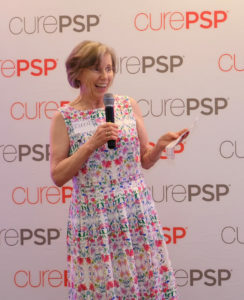 My husband passed in 2012, and in 2013 I was invited to sit on CurePSP’s board, serving as an advocate for patients and caregivers. Since that time, I have attended several of the family conferences, leading the conferences’ support groups as well as participating in panels; answering questions and sharing my story. In Dallas, I continue advocating through our support group and holding awareness and fundraising days in May. I also work as a peer volunteer, making myself available by phone for patients and caregivers nationwide who are looking for answers, or someone to talk to that understands their journey. Tell us about Hope Squared – who is involved, what organizations are involved, and how have you pulled it together? Our Hope Squared fundraiser in Dallas is scheduled for May 19. 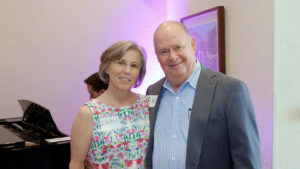 Our organizing committee consist of members from various organizations, such as Parkinson’s, Texas Health Presbyterian Hospital, the Center of Neurology in Dallas, and the Belmont Village Assisted Living on Turtle Creek. Each member has brought a diversified combination of talent and awareness that has contributed to a more widespread understanding of all prime of life brain diseases.